The ocean, one of the world’s greatest wonders, should be accessible to everyone, according to this man who helps disabled kids surf the waves in Wales. Benjamin Clifford looks like your idea of a picture-perfect surfer. But underneath the laid-back demeanour, love of the ocean, and masses of sea-curled hair, he’s got a really important purpose: accessible surfing for all. So, Ben set up Surfability UK CIC, the first truly inclusive, fully adaptive surf school on our little island. Set up as a not for profit community interest company, Ben and his staff have been helping people from all walks of life and all abilities learn to ride the waves. His pupils are committed to spending time in the ocean and refuse to let their conditions – which range from mild learning disabilities to quadriplegic cerebral palsy – stop them. One of Ben’s pupils is called Ethan. He has diplegic cerebral palsy, a condition which stiffens and contracts the muscles in his arms and legs, and leaves Ethan needing assistance with walking. He and his mum thought would it would stop him ever going in the sea, let alone surfing the ocean waves. I always imagined surfing. But I never thought I could actually do it. When my mum found the surfing introduction with Ben, she bought me down to our local beach and I fell in love with surfing that day. They’ve helped me a lot and I really appreciate what Ben and Toby have done for me and I don’t want to leave [the sea]! He made the trip along the South Wales coast from his hometown, Cwmbran, to be at the beach today to enjoy his accessible surfing lesson. No doubt he’ll be back in the Big Blue with Ben in no time – he’s currently in training for the World Championships, Ben adds, so best not miss a class! All ages are welcome at Surfability UK, and Ben is determined accessible surfing will be available to anyone, from five to 50 and beyond, with varying abilities. Some people just need the instructions for surfing explained to them a little bit differently, Ben explains, some need extra physical assistance, while others are dependent on the coaches to help them to surf. Katie, a local Welsh student with dyslexia and dyspraxia, has been going to Surfability UK for some coaching for a while, but at today’s session was proud to tell UNILAD she managed standing up on her board for the first time. 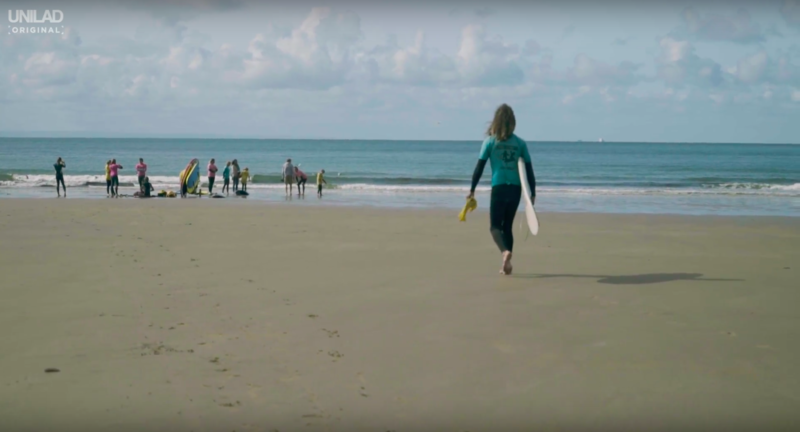 It’s the kind of achievement everyone would be proud of – speaking as someone who’s tried to carve up the waves and failed miserably – but for Katie, whose dyspraxia affects her movement and co-ordination, the option of accessible surfing means so much more. It feels really good to be up on the board. It really does make you feel the adrenaline kicking in as soon as you catch the wave. I really enjoy it. It’s helped me with confidence building in my abilities, as well as getting to know different types of people and hear their stories. From pupils who have said their first words while surfing, to simply watching kids develop week by week, Ben says his work is hugely rewarding. Two different pupils, Ben recalls, said their first ever words during one of his classes – amazingly, both the pupils in question independently came out with the sentence, ‘I want another wave’. Undoubtedly, the feeling of being in the ocean is one of life’s greatest joys. But surfing offers other skills beyond adrenaline pumping too, which your parents’ generation might’ve called ‘character building’. Now, if you’ve ever spent anytime in the sea around the British coast, you’ll be familiar with the tortuous experience of cramming your body into a wetsuit and lugging your gear down from a little, oftentimes freezing shack to the water’s edge. No such problems for Ben’s students, who arrive for their weekly lessons at a fully kitted out (and heated) hut in Oystermouth, overlooking the Mumbles Pier and one of Wales’ many old castles. Ben says it ‘can be tricky’ for some of his students, but the school has invested in changing tables and adaptive wetsuits which are easier to put on and alleviate some of the stress for carers, empowering the students to ready themselves for the surf. Once the class is suited and booted, they all head down to the beach with their allocated volunteers and helpers – sometimes two or three members of staff, depending on the needs of the pupil. But to make manifest his dream of people with disabilities to be able to surf everyday, should they want to, Ben needed to enlist some help. Ben qualified to work in a Special Educational Needs school for three years where he learned the ins and outs of working with children with all abilities. He’s since been able to write a qualification course for all his volunteers too, who are now accredited in coaching adaptive surfing, and a part of an ever-expanding team. The surfboards are then set up with whatever extra equipment each pupil needs. Some can be specially fitted with seats for those who can’t surf unaided. Surfability UK even offer seated tandem surfboards which are so well decked out, they require four volunteers to take one pupil out to catch some waves. But there is no ask too big for Ben and his team. It’s so good to be able to give someone their first experience of surfing. A lot of people in Swansea might be looking at the sea all the time, but are unable to access it. It must be really frustrating. So, for them to be able to come down to the sea and jump in a beach chair – or whatever they might need – and be able to get in the water and catch waves is fantastic. Catching a wave is a feeling everyone should be able to have, or just try, however they can do it. Ben, who has been coaching and teaching people how to surf for over a decade, was inspired to open up the option of surfing to everyone of different abilities after meeting a group of young people with autism at a one-off water sports event for disabled children. He told UNILAD how being in the water had an ‘amazing impact’ on those young people lucky enough to get a spot at the day event, and immediately thought it was a shame everyone couldn’t access this kind of activity day in, day out. 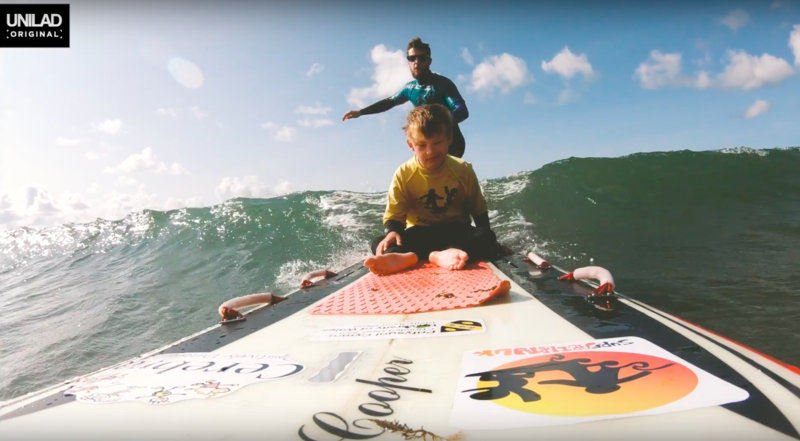 Ben is aware some conditions are so devastating they do stop some pupils standing up – but he’s always trying to come up with solutions to provide the closest thing possible to the feeling of catching a wave. There’s something for everyone, Ben hopes. We have people come to the school, not for a surf lesson, but for more of an experience. If they’re dependent on us to surf they might sit on a seat or a tandem board and we’ll be doing everything for them. Then we have other people like Ethan, who’s training for the world championships. The point being, no so-called disability can get between a person and the ocean, in Ben’s books. Ben made the decision to set up Surfability UK as a not for profit company, because this allows him to only charge pupils a small fee for lessons, relying instead on public donations and grants from charities like the Prince’s Trust to cover costs. Any money he does make goes back into developing more and more technologies and solutions to help those with different abilities surf, and the amount of people who turn up to classes is increasing every year, he said. He added his experience shows, generally, young people with disabilities can be ‘quite socially isolated’ so it’s amazing to be able to provide them with a group they can join, and make some mates with whom to share the surf. People come down and see what we do and are blown away by it. But it’s normal for us. Why shouldn’t it be inclusive? Every sport should be inclusive. In five years, Surfability UK CIC has helped 1,800 people learn adaptive surfing. Not all heroes wear capes. Some wear wetsuits. To help Surfability UK CIC raise enough money to carry on their life-changing work, you can donate or help them fundraise for free every time you shop online through their GoRaise page.